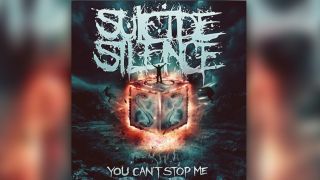 Suicide Silence have unveiled the cover and tracklist for upcoming album You Can’t Stop Me – their first without late frontman Mitch Lucker. They recruited Eddie Hermida from All Shall Perish last year after deciding to continue their career. He recently revealed the record includes lyrics written by Lucker before his tragic motorbike accident in 2012. Hermida said: “It’s about him being bigger than life – about finding that true resilience in yourself to keep going. The follow-up to 2011’s The Black Crown is released via Nuclear Blast on July 14. It includes guest appearances by George ‘Corpsegrinder’ Fisher and Greg Puciato.